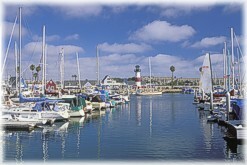 Oceanside is the most northerly coastal city in San Diego County. It's a thriving city located just 35 miles north of San Diego and 83 miles south of Los Angeles. Oceanside lies between Carlsbad and Camp Pendleton, the nation's largest Marine base, which played a big role in Oceanside's history and is still important to its economy. The Oceanside Zip Codes are 92049, 92051, 92052, 92054, 92056, 92057 and 92058. Search MLS data for Oceanside real estate & Oceanside homes for sale. Oceanside's first inhabitants, the Luiseno Indians, lived near where the Mission San Luis Rey was established in 1798. During the period of massive Mexican land grants, Pio Pico and his brother, Andreas, received 133,441 acres from Governor Alvarado in 1841. The site, now know as the Camp Pendleton Marine Corps Base, was held privately until 1942 when it was sold to the United States Navy. When the California Southern Railway was completed in 1883, the beach area of San Diego County opened up for development and the real history of Oceanside began. The highway between San Diego and Los Angeles was paved in 1920, bringing more growth and prosperity to Oceanside including street lights, a golf course and a grand new theater, "The Palomar." 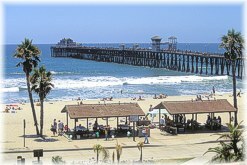 The first pile on the Oceanside pier was driven in 1888. After being destroyed by a storm in 1890-91, it was rebuilt in 1893. The current pier and sixth pier was completed in 1987. Oceanside offers three miles of beautiful wide, sandy beaches, the 1,900-foot Oceanside Pier and the wonderful 900-slip Oceanside Harbor - the only place in coastal North San Diego County to moor a boat. Plans are under way for a new luxury hotel resort, which promises to enhance Oceanside's image. The "downtown" section of Oceanside is filled with shops, services, hotels and other tourist activities. 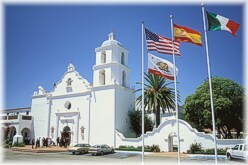 Four miles east of downtown is the beautiful and historic San Luis Rey Mission. It's a must-see when you're in Oceanside. The Oceanside Regional Travel Center is a major transportation hub for the military and for commuters traveling downtown and to Orange County and Los Angeles. Completed in 1983, it connects Amtrak, the Coaster, the Metroliner, Greyhound and local bus routes. Search MLS data for Oceanside real estate & Oceanside homes for sale. The average age of Oceanside residents is one of the youngest of the coastal North San Diego cities. However, since Oceanside housing is relatively affordable, many retired people are attracted to a number of adult communities and mobile-home parks. Ocean Hills is a model senior neighborhood offering golf and other activities in a beautiful, safe, gate-guarded environment. Oceanside has a small airport for private planes on the northern border. The 121-acre, hilltop main campus of Mira Costa College, serving 7,500 students is in Oceanside. Many orchards and plant nurseries set along the fertile San Luis Rey River Valley. Biogen, which bought locally born biotech company Idec, is spending $400 million to build a manufacturing plant in Oceanside that the company predicts could eventually employ 2,000 people. each with a unique character. The older coastal neighborhood, west of I-5, has everything from condominiums and apartments to smaller houses and luxurious ocean-front Oceanside homes at relative bargain prices. New row-style beach homes are going up everywhere and have really transitioned downtown Oceanside into an upscale residential community. Going east, you'll find a transitional area of homes and older retail strip centers, built in the 1950s and 1960s. This region gives way to the inland suburban neighborhoods, which are exploding with new, affordable housing. The median Oceanside home price is only two-thirds that of Carlsbad or Encinitas. Lots of affordable land has spawned new subdivisions in eastern Oceanside making the dream of owning Oceanside real estate come true for young families and retirees, alike. New Oceanside schools and shopping malls are springing up at every corner. Here you'll find a vast collection of "big box" stores such as Walmart, Target and Best Buy. Search MLS data for Oceanside real estate & Oceanside homes for sale. The Oceanside Unified School District is one of the most diverse in San Diego County. It serves 22,000 students in 17 elementary schools, three middle schools, two comprehensive high schools, three charter schools and two alternative schools. Six Oceanside elementary schools were recently nominated for the California Distinguished School Award. Proposition 55 will bring an additional $120 million to match the $125 million approved by voters for the modernization and construction of Oceanside schools. See more information below on Cardiff schools or go to School Reports. If you want to buy a home in Oceanside or if you already own a home in Oceanside, protect your investment by looking at Real Estate Statistics. There, you can track the average sales price, days on the market, sale to list price ratios and more. Included are vital statistics, charts and graphs on Oceanside real estate, shown on a monthly and annual basis. And, be sure to sign up for the free e-mail reports on Oceanside real estate trends by going to Real Estate Trends. Want more information on Oceanside real estate and homes for sale? Click here to contact Neal Hribar, your Berkshire Hathaway HomeServices, California Properties Oceanside real estate agent. What homes are currently for sale in Oceanside? Click here to do an instant search of Oceanside real estate for sale.